Shimla : Himachal Pradesh Chief Minister Virbhadra Singh flagged-off State level Ranger and Rovers trekking expedition of Bharat Scouts and Guides from the Ridge today. 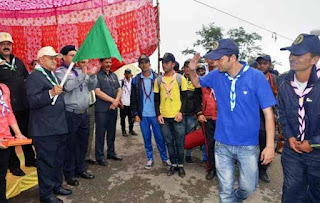 The three day trek will pass through Shalli Tibba and other parts of the Shimla Rural assembly segment in which 130 students were participating, there were 47 girls and 83 boys participating in the expedition. He said that the motive of the expedition was to provide opportunity for the youth to identify and enhance their physical capacities and to get themselves adjusted in adverse climatic and other situations. The Chief Minister said that this would provide an opportunity to the rangers and rovers to study vegetation and climatic condition of different heights and this would also give them an opportunity to intermingle with each other. Director Higher Education, Dinkar Burathoki, while detailing about the expedition said that that the trek would pass through Thaila, Badwain, Gulthani, Sanahu, Panjaili, Khatnol, Shalli Peak (9423 feet), Glah, Chapdani, Shada, Nadot, Kariali and back to Shimla on 25th July. Deputy Commissioner Shimla Dinesh Malhotra, S.P. D.W. Negi were also present on the occasion amongst others.